WASHINGTON — Oil and gas executives have watched wearily in recent years as the relationship between the United States and Russia deteriorated, steadily closing off their ability to drill the vast shale plays underlying Siberia and the deep-water oil fields off Russia’s Arctic coast. Now, spurred by President Donald Trump’s controversial appearance with Russian President Vladimir Putin, Congress is considering a flurry of legislation that threatens to go even further, potentially forcing U.S. and European companies such as Exxon Mobil and Royal Dutch Shell to divest positions not only in Russia but also around the world. Existing oil and gas operations in Russia that largely were exempted under previous U.S. sanctions instituted in 2014 and 2017 could be placed on the chopping block, along with projects in other countries where Western oil companies have partnered with Russian firms. Expanding the sanctions almost certainly would have implications for the energy sector in Houston, where Exxon, Shell and other oil companies doing business in Russia have major operations. 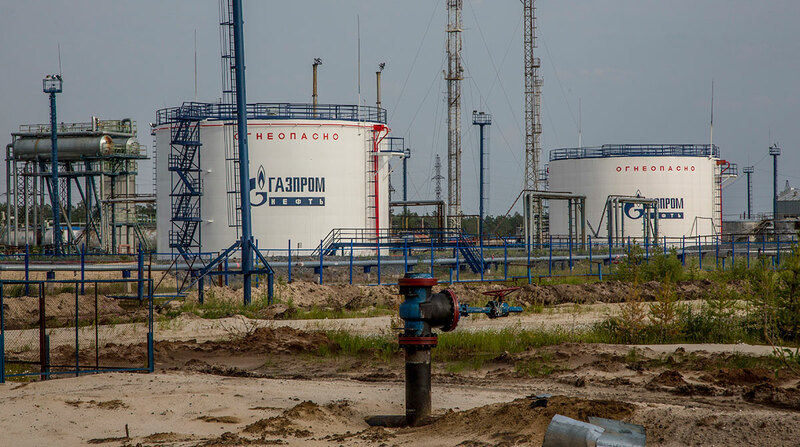 International energy services companies that employ thousands in Houston and Texas, such as Halliburton Co. and Schlumberger Ltd., also would likely be affected by aggressive sanctions against Russia, the world’s biggest oil producer. Halliburton ranks No. 7 on the Transport Topics Top 100 list of the largest private carriers in North America, and Schlumberger is No. 11. With the midterm election fast approaching, Congress is debating how to deter Russia from meddling in that and future U.S. elections. At the forefront is bipartisan legislation introduced more than 12 months ago by Sen. Marco Rubio (R-Fla.) and Sen. Chris Van Hollen (D-Md.). The bill would require the U.S. government to automatically impose sanctions on “major sectors of the Russian economy, including finance, energy, defense, and metals and mining” should the director of national intelligence determine that Russia was buying advertising or using social media to influence the outcome of an American election. The United States imposed sanctions on Russia after it invaded Ukraine in 2014. Those sanctions largely were limited to individual businessmen and officials considered to be close to Putin, allowing U.S. oil companies to do business with Russian firms such as Rosneft. Now, politicians of both parties,such as Sen. Robert Menendez (D-N.J.) and Sen. Lindsey Graham (R-S.C.) are calling for what Congress wanted to avoid in 2014 — disrupting Russian energy production and potentially driving up global oil prices. The rush of anti-Russian sentiment in Congress is worrying oil and gas executives, who fear their companies soon could be barred from operating in Russia, which has some of the largest oil reserves in the world, and working with Russian firms through joint ventures, which are commonplace for oil and gas projects that can cost tens of billions of dollars. As relations between Moscow and Washington deteriorated over the past decade, U.S. oil and gas companies have backed away from Russia. The Houston independent Conoco Phillips sold off the last of its operations there in 2015. Earlier this year, Exxon announced it had pulled out of a 2013 deal with Rosneft to explore for Russian oil and gas, citing U.S. sanctions. But the U.S. oil industry still has a considerable presence within the country. Exxon Mobil, for example, counts almost $6 billion in assets in Russia, including a sprawling, almost decade-old oil and gas operation on frigid Sakhalin Island, according to a filing with the U.S. Securities and Exchange Commission earlier this year. Exxon also holds a 25% stake in Tengizchevroil, a joint venture in Kazakstan’s Caspian Sea, in which a subsidiary of Lukoil also is partner. Chevron, likewise, could be exposed to new Russia sanctions through its 50% stake in the same venture in the Caspian. The California oil company also holds a 15% interest in a pipeline running from the Caspian Sea to the Russian city of Novorossiysk, in which Lukoil and Rosneft, as well as the Russian pipeline firm Transneft, also have a stake. So far, oil companies are staying quiet on the sanctions debate, caught between their own financial interests and U.S. national security. The industry’s chief lobbying arm, the American Petroleum Institute, declined to comment on the Russian sanctions legislation, as did Exxon and Chevron. At the center of the debate in Washington is the construction of the Nordstream 2 pipeline, which would deliver natural gas from Russia to Germany underneath the Baltic Sea, securing the Russian energy supply line into Europe for decades to come. Both the Trump and Obama administrations publicly opposed the project as likely to increase Russian influence in Europe. Last month, Sen. John Barrasso (R-Wyo.) introduced a bill calling for sanctions on the Nordstream project while urging the Energy Department to speed up approval of liquefied natural gas exports to Europe. But such a move could have unintended consequences since European companies, including Shell, are partners with Rosneft in the 760-mile pipeline. While headquartered in the Netherlands, Shell has large operations across the United States, potentially forcing the U.S. government to pursue a legal case against a major domestic employer. Shell did not respond to a request for comment. Congressional hearings on pursuing further Russian sanctions are expected to begin later this summer. But already lawyers and policy analysts close to the energy industry are making the case against doing anything to damage Russia’s oil sector. The risk politicians face is that if the United States imposes sanctions that push U.S. and European companies out of Russia, they would be replaced by oil companies from China or other countries. At the same time, the geopolitical turbulence probably would drive up oil and gasoline prices, hurting American consumers while increasing profits for Russian oil firms. As reports of Russian meddling ahead of the midterm elections pop up, the likelihood of congressional action against Russia increases, said Goldwyn, the Atlantic Council energy specialist. Big Oil Is Raking in Cash, So Investors Are Asking: Now What?